SALT LAKE CITY (May 25, 2017) – Press Release – The 13th edition of the Larry H. Miller Tour of Utah will feature 600 miles of racing and 36,525 feet of elevation gain for the seven-day, men’s professional stage race. 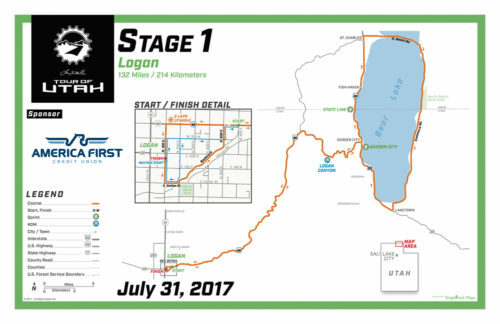 Detailed maps are below and informational videos for each stage, held July 31-August 6, are now available on the official website, TourofUtah.com, and on social media channels. Three mountaintop finishes are part of “America’s Toughest Stage Race” in 2017, with one finish including an uphill individual time trial. Sanctioned by the Union Cycliste Internationale (UCI), the Tour of Utah course will offer a total of eight Utah Office of Tourism King of the Mountain (KOM) climbs and 11 Utah Sports Commission Sprint lines. Returning to the Tour for the first time since 2011 is the individual time trial (ITT), which will be a six-mile, uphill race against the clock to a finish line at Brighton Ski Resort at the uppermost section of Big Cottonwood Canyon. Also returning, for the first time since 2009, is the fan-friendly final stage in Salt Lake City, with finishing circuits around the Utah State Capitol buildings and Avenues neighborhood. The signature “Queen Stage” of the Tour has been reconfigured this year, but remains one of the toughest finishing climbs for any UCI stage race, featuring the hors category (HC, or beyond classification), six-mile ascent of Little Cottonwood Canyon to Snowbird Resort. The other mountaintop finishes are on Stage 2 at Snowbasin Resort and on Stage 3 with the ITT in Big Cottonwood Canyon. The first five stages feature morning start times, which will accommodate live national television broadcasts on FOX Sports Network (FSN) for race finishes at approximately 1:30-2 p.m. MT. Saturday and Sunday stages will begin at 1:10 p.m. and are scheduled for a 2-4 p.m. MT televised time slot across the United States. FSN will also broadcast evening highlight shows, and TourTracker will provide start-to-finish live race coverage via web cast and mobile applications all week. More details regarding TourTracker coverage and regional programming will be made available in July. Four of the 10 host venues are anchoring a start and/or finish line for the first time — Brigham City, Big Cottonwood Canyon, South Jordan and Layton. Salt Lake City and Snowbird Resort have the longest tenures as host venues, each being part of the race for 10 of the 13 years. Logan will serve as race headquarters for overall start festivities, including the Team Presentation on Saturday, July 29, which is free for spectators. 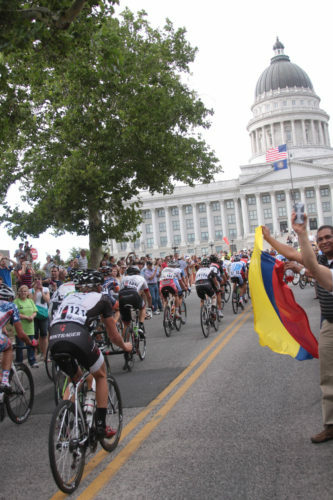 Bountiful returns for a third year as a stage finish, and Heber Valley returns for a second time as a stage start, which will also host the start for The Ultimate Challenge citizens ride presented by University of Utah Health. “We are proud to design and orchestrate new race courses each year. This year’s Tour of Utah brings back the individual time trial and the circuit race at the Capitol, which will both challenge the professional athletes and energize our fans. With live broadcasts each day on Tour Tracker and FOX Sports Network, we can bring the excitement of the race and the beauty of Utah to fans all over the world,” said Jenn Andrs, executive director of the Larry H. Miller Tour of Utah. Stage 1 presented by America First Credit Union is the longest day of the Tour of Utah at 132 miles. Home to Utah State University, Logan previously served as the overall start community for the 2015 Tour of Utah. This is the same route used two years ago, rolling across scenic roads in two states and testing the legs with 6,550 feet of elevation gain. 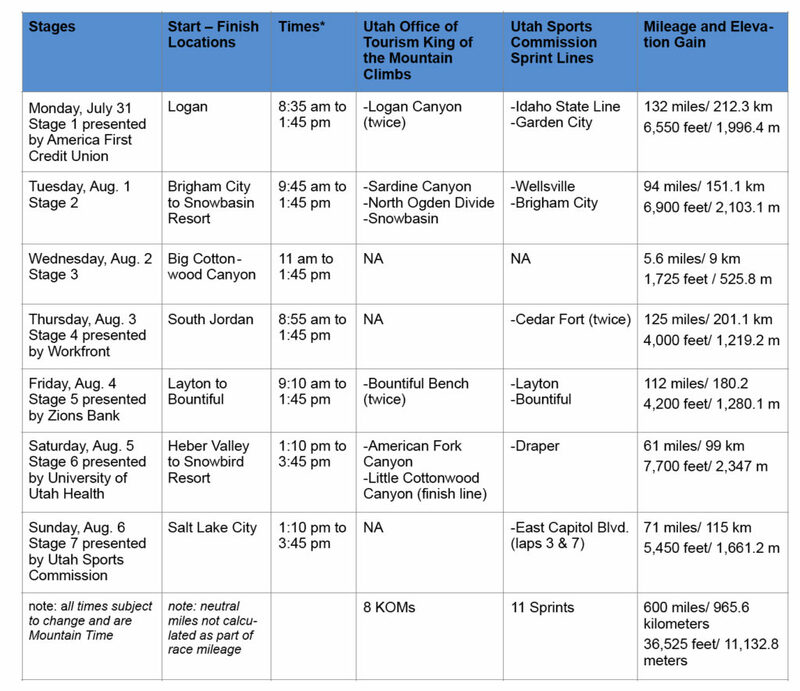 The peloton begins on Monday, July 31 heading through Logan Canyon, a rugged area that offers a Utah Office of Tourism KOM climb in both directions. From Garden City, the first Utah Sports Commission Sprint line will await on the Idaho state border. The route will navigate clockwise for 48 miles around Bear Lake, known as the “Caribbean of the Rockies” for its turquoise-colored water. Returning through Garden City and Logan Canyon to the Cache Valley, there will be two circuits in downtown Logan for fans to watch, with the finish along North 100 East and Federal Avenue. 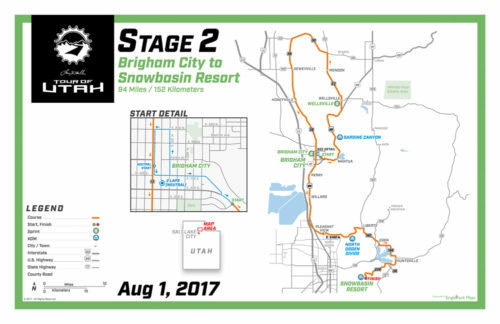 Stage 2 will debut a new start in picturesque Brigham City, nestled against the northernmost section of the Wasatch Front. The 94-mile climbing affair on Tuesday, Aug. 1 begins with two neutral laps in downtown Brigham City, starting on Main Street near 100 South. It only takes 11 miles into the stage before the racers encounter the first of three Utah Office of Tourism KOMs, which total 6,900 feet of elevation gain for the day. This is the first time the Tour will climb Sardine Canyon, which sits next to Mt. Sterling. After circling the Wellsville Mountains in a counter-clockwise direction, the route returns through Brigham City for a Utah Sports Commission Sprint line on Historic Main Street. The route will turn south and follow State Highway 89 to reach the North Ogden Divide. After passing on the east side of Pineview Reservoir, the route will launch the climbers for the first mountaintop finish of the week at Snowbasin Resort. The final climb is a double-pitched incline to the resort covering six miles with a six percent average gradient, and has not been used in the race before. Stage 3 on Wednesday, Aug. 2, marks the return of the popular ITT. In 2011, American Tejay Van Garderen won the Stage 3 ITT on his 23rd birthday at Miller Motorsports Park. This year, the ITT will look nothing like the flat course of the race track. Starting at an elevation of 7,300 feet, the course climbs 1,725 vertical feet and provides a tough 5.6-mile ascent of Big Cottonwood Canyon Road, from the Donut Falls Trailhead parking at Reynolds Gulch to the front door of Brighton Ski Resort. The route passes Solitude Ski Resort and the turnoff to Guardsman Pass, flanked along the road by towering spruce trees and rock vistas that are part of the Uinta- Wasatch-Cache National Forest. With a 5.5 percent average gradient, the course should favor a strong rider who excels at high altitude. Stage 4 presented by Workfront covers new territory across 125 miles in Salt Lake, Tooele and Utah counties on Thursday, Aug. 3. The stage begins with the inaugural start/finish in South Jordan, located on Redwood Road next to South Jordan City Park. The race will use 11400 South to reach the Mountain View Corridor and head to the west desert and Rush Valley. A surprise for the riders will be Faust Road, 10 miles of maintained dirt and gravel, which will connect to the old Pony Express Trail. The course will cross Five Mile Pass, a former thoroughfare in the 1800s for the stagecoach and pioneer families heading west. Here in the shadows of the Oquirrh Mountains, riders will find little protection from the wind. Two Utah Office of Tourism Sprints will be contested on the out-and-back section of SR 73 at Cedar Fort. With 4,000 feet of elevation gain, this should bring a Wild West finish back into South Jordan. There will be two finishing circuits of three miles each around South Jordan City Park. 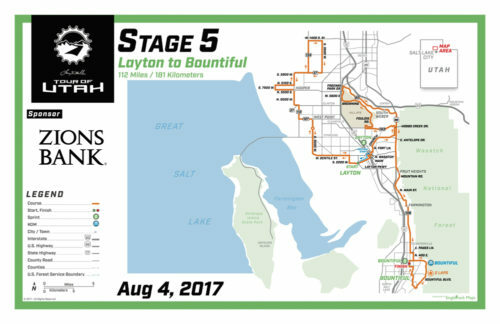 Friday, Aug. 4, brings Stage 5 presented by Zions Bank back to Davis County for a third consecutive year. New for 2017 will be an inaugural stage start in Layton. The 112-mile course rolls toward Hooper and the Great Salt Lake for 53 miles of rural roads in Davis and Weber counties. Passing through downtown Layton for a second time, the Utah Sports Commission Sprint line will be staged at Wasatch Drive. A new section of the course will take State Road 93 to access Hill Air Force Base, using the South Gate Entrance, for the first time. The route will follow Foulois Road to Wardleigh Road on the base, exiting near the Hill Aerospace Museum, the largest museum west of the Mississippi River. Heading for the traditional finish in Bountiful, the route will follow sections of U.S. Highway 89 and Mountain Road to reach the nine-mile circuit. After two crushing climbs across the Bountiful Bench, each designated with a Utah Office of Tourism KOM, the 4,200-feet of climbing of the stage will end on Main Street at Center Street, with the peloton racing in the northbound direction. 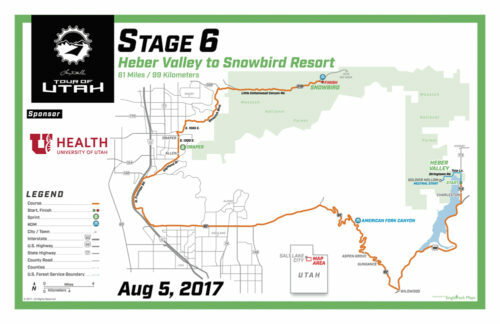 Saturday, Aug. 5, marks the return of the “Queen Stage” of the Tour of Utah, Stage 6 presented by University of Utah Health. This year’s course uses the original route over Alpine Loop that was introduced in 2006. At 61 miles in length, the course is much shorter than previous editions, but not easier. This stage begins for a second time in the southeast corner of the Heber Valley in the shadow of Mount Timpanogos at the stadium of Soldier Hollow. The racers will only have a few miles around Deer Creek Reservoir before tackling the Alpine Loop, a Category 1 climb through American Fork Canyon, passing Sundance Resort and Timpanogos Cave National Monument. The route travels through the cities of Draper and Sandy before passing huge crowds at Tanners Flat for the final fireworks on the Hors Category climb to Snowbird Resort through Little Cottonwood Canyon, the signature six-mile ascent featuring 8-12 percent gradients. The Ultimate Challenge presented by University of Utah Health will take place on Saturday as well, allowing recreational cyclists to tackle the same route as the professionals. The Ultimate Challenge will begin at 9:30 a.m. MT in the Heber Valley at Soldier Hollow. Participants receive ride support, as well as a timed section along the Little Cottonwood Canyon climb to allow them to compare personal ride times to those of the pros. All participants of The Ultimate Challenge will receive post-ride food and beverages with a reserved space to watch the finish of Stage 6, expected between 3:30-4 p.m. This marks the eighth year for this non-competitive, gran fondo-style bicycle ride. Registration for The Ultimate Challenge is available online for $140, with a team discount offered for groups of eight or more. 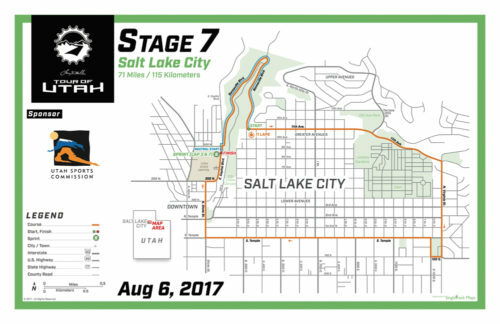 Stage 7 presented by Utah Sports Commission brings back the overall finish to Salt Lake City for the first time since 2009. This 6.8-mile circuit is the same course that was first introduced in 2013 for a Friday stage, but this time the distance has been doubled to a total of 71 miles with 5,450 feet of climbing. There will be a total of 11 total laps, including intermediate sprints on laps three and seven, plus a time bonus at the finish. The course begins and ends on the east side of the Utah State Capitol, with an uphill finish along State Street and at the summit of East Capitol Boulevard. Other viewing areas include Bonneville Boulevard around City Creek Canyon and the serpentine turns around Reservoir Park. The overall champion of the Larry H. Miller Tour of Utah could be decided on this seventh day of racing. The Larry H. Miller Tour of Utah gained international accreditation in 2011 when it was first sanctioned by the UCI. In 2015 the race was elevated to the 2.HC ranking, one of only two such multi-day events in North America. This year’s Tour of Utah will continue as the first internationally-sanctioned cycling competition in North America for men following the Tour de France. To date, 14 of the final 16 men’s professional teams have been confirmed to compete, with rosters expected the final week of July. More information about the Tour of Utah, host venues and professional teams can be found by visiting www.tourofutah.com.